For such a great show like Breaking BAd, you need to watch it in good quality and legally. Just sign up to Netflix or get the free months trial and watch every episode in top quality. What is the point in pirating when it is so easily available and dirt cheap. This show is seriously awesome. 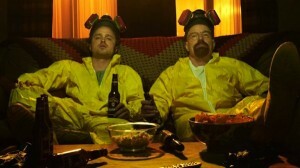 Whatever you are into, if you havent seen Breaking Bad yet – Watch It. And none of that pirated low quality %!&? either.